First Minister Nicola Sturgeon joined her mother Joan to reopen Saltcoats town hall after a multimillion-pound refurbishment. 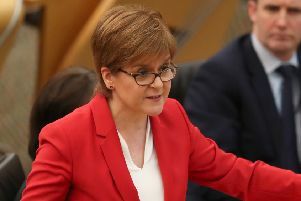 Ms Sturgeon said it was “nice, if a wee bit surreal” to carry out the engagement with her mother Joan Sturgeon, who is provost of North Ayrshire Council. The First Minister, who grew up in nearby Irvine, said it was nice to be back in the town where she worked for a spell as a student. She toured the revitalised town hall, which now functions as a marriage venue, conference centre and council offices. It follows a £3.8 million restoration project led by the local council with financial support from the Scottish Government and Cosla regeneration capital grant fund and Historic Scotland. Ms Sturgeon said: “It’s always nice to be back in Ayrshire and this is a great occasion. They’ve done a fantastic job and it’s great to see it looking so stunning. The town house and steeple date back almost 200 years, with the adjoining town hall added in 1892 as Saltcoats grew. At one time it served as a cinema for the town. It closed in July 2010 and work started to renovate the building last year. Joan Sturgeon said: “It’s an iconic building that was in a state of total disrepair. To see it refurbished like this means the world to everybody. Asked about the reopening as a family affair, the provost said: “I’m immensely proud.